When a tooth is heavily decayed it may be too weak to survive and also it is more likely to fracture and lose considerable tooth substance. The greater risk is that a fracture line may go below the margin of the gum which makes restoration more difficult or near impossible. What will a dental crown do for me? Dental crowns protect weak teeth from chipping or to bond together a cracked tooth. Crowns will restore a tooth that has been worn/grinded down. Crowns can cover a tooth with a large filling (cosmetic)Crowns are commonly used to secure dental bridges in situ. Cosmetic repair to misshaped or stained, or discolored teeth.Dental crowns are always used as the tooth for dental implants. Crowns, also known as caps, restore damaged teeth. A crown covers a tooth and mimics the shape, size and color of the surrounding teeth. Crowns are indicated for cracked teeth and teeth with deep cavities; to protect teeth that have been filled by root-canal treatment; to provide extra support for bridges; and to cover poorly shaped or colored teeth. Crowns may be made of metal, porcelain, or newer restorative materials. 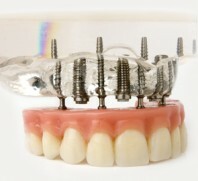 They are custom-made and fitted for each patient in conformation with the patient’s bite, and the size and length of the natural teeth. Dental crowns typically last five to eight years, but can last much longer with proper oral hygiene.